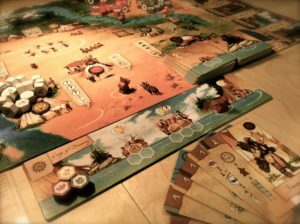 Lewis & Clark is a card management, race game by Cédrick Chaboussit, published in 2013 by Asmodee Games. Players manage the roles of historical characters who conducted an expedition finding a Northwest passage to the Pacific Ocean. Along the way, players use the help of Native Americans to advance their parties along the rivers and through the mountains. 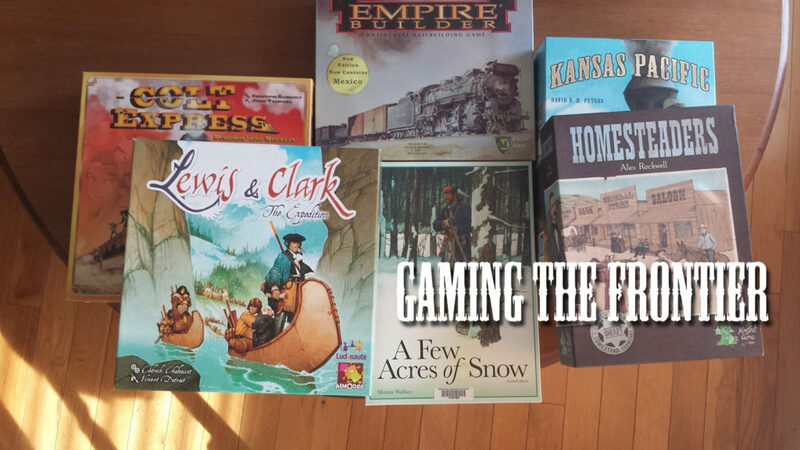 In this second interview for my Gaming the Frontier series, I am pleased to be joined by French game designer, Cédrick Chaboussit, who shares about the design process for Lewis & Clark. Matt Saunders (MS) Could you please introduce yourself? Who are you and what do you do when you aren’t designing board games? I’m Cédrick Chaboussit (CC), 43, married and father of 3 little girls (between 12 and 6 years old), living in a small city on the west coast of France, near La Rochelle. I’m working as a project engineer in a company manufacturing equipments for the food and health industries. I used to play basketball a lot and when I stopped, I got more time to dig into my beloved hobby of boardgames. (MS) What is the story behind designing Lewis and Clark? (CC) I’ve always played a lot of game and I believed I could bring some new game mechanics on the scene. I started designing this game like my other designs : from its mechanism. The meeting and the collaboration with the publisher (Ludonaute) went amazingly fast and fine afterwards. As I also have a strong interest for History, I was very happy when we agreed to shift the initial game called “le village 1900” from a historical background to another. (MS) Can you point to any movies, books, stories, or other sources that inspired you to design your game and choose this theme? (CC) We were looking with the publisher for an interesting story to tell, and as we were narrowing the possible themes, we agreed on the Lewis & Clark Expedition. I had heard about it before, and my wife as an English teacher too. This story is not well known in Europe. But it’s during the development of the game that I delved into it in details, I learned a lot, and loved doing that. (MS) What (if any) type of research about the American Frontier did you do when designing your game? Can you list any books, articles, or experts that you consulted with to gain a perspective about the American Frontier? (MS) Would you say Lewis and Clark attempts to capture more of a “realistic” or “romantic” sense of the American Frontier? Why? (CC) We designed the game trying to be faithful with the official History, emphasizing of the necessary collaboration with the natives. They were the only ones who knew the land and its dangers. I wanted the game to be as accurate as possible because I love History and I’m always interested in learning new things, so I wanted to share that love with gamers. Taking the “realistic” road was not the easiest, because it gives less freedom, which can be a problem with game design sometimes. I read very recently the first part of a US comic called “Manifest Destiny” which presents a “romantic” view of the expedition, I found it very refreshing, I’m eager to see what happens next! (MS) What challenges did you face when designing the game? For example, was it difficult to find mechanics to fit the theme? (CC) As I explained earlier, the main mechanism (we called “handbuilding”) was solid in the original prototype, and the theme of Lewis & Clark had a strong impact on the whole game, the main thing we had to change was the Mountain spaces, which was a second kind of objective. Many things had to be changed, it was hard work, but very rewarding. The only discrepancy we had to leave was 1 expedition of 30 characters historically replaced by 2 to 5 expeditions of 6 characters (I always considered Seaman as a character). We also put aside the discovery aspect of the expedition, which has been introduced deeply with our second game called “Discoveries” (2015). A game cannot be historically 100% accurate but I think we did a good job. (MS) Thinking about the integration of theme and mechanisms, how does your game portray Native Americans (Indians) and the relationship they had with European-descendant Americans? (CC) As read in the various documentations, I chose to present the native Americans and the collaboration with them as the only way to succeed for the expedition. What Sacagawea has done is for me the symbol of the roles played by the native Americans. In the game, it’s materialized by the cards you need to build your hand with and the meeples you get and play on the village. (MS) What influenced your portrayal of Native Americans (books, articles, personal beliefs, etc.)? (CC) It comes from the books, articles and documentaries, reported mainly by the members of the expedition. (MS) How do you think your game’s portrayal of Native Americans compares to other forms of entertainment (books, films, etc.)? (CC) The games gives a different perspective as it’s an active media, you experience personally the need of collaborating with the natives. If you don’t do so, you will lose! (MS) What type of experience do you want players to have from playing Lewis and Clark? Is there anything specific about life on the American Frontier that you wish for players to experience? (CC) There are many things we wanted the players to experience: the necessity of collaborating with the natives, the need to rest, the difficulty to move forward and also the beauty of the landscapes and people (thanks to the wonderful art of Vincent Dutrait). We placed a lot of historical notes in the rulebook. (MS) If your game were to be used in an educational context (for example, a high school history class) what would you hope students learn from your game? (CC) I don’t think this would be possible as this game is a gamers game, people have to be familiar with heavy games before being able to play it. We did not make a game for educational purpose but we designed a game for gamers which can also educate them, but it was not the aim of the game. (MS) Has your game been used in any classrooms? If so, what feedback have you received? 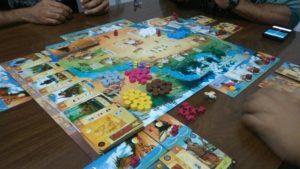 (CC) I read some teacher used Lewis & Clark or Discoveries (probably the latter) in school but I do not remember exactly where, there are some threads of the bgg forums I think. (MS) Finally, is there anything else you would want students of history to know about your game? (CC) I would like to add that History is fantastic. I did not study history myself but I really love it, our ancestors have been there for a while and have many stories to tell us, we should not live without considering this! I’m thankful Cédrick Chaboussit took the time to answer these questions. 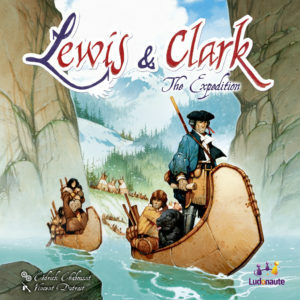 To find out more information about Lewis & Clark please visit the game’s entry at BoardGameGeek.com. Cédrick also created a designer diary for Lewis & Clark, which can be found here.